Hi everyone. Today has been spend packing for a little trip. Most of my clothes I've packed are from the new Beth Ditto collection and it took a while to decide what cosmetics to take. I think I may have over packed for such a short amount of time, but I don't care. Better to be safe than sorry. You never know.. I might need three foundations! So, over the past couple of days I've received two foundations. I got them both from the QVC Four Easy Payments beauty day. Who can say no to an offer like that? Another thing that I adore about QVC is the fact that you can use the items for 30 days and if you don't like them you can send them back... even cosmetics! I've never had to send anything back yet, but it's good that have that peace of mind. I got this foundation in the shade 0 - Porcelin. I haven't tried this foundation yet, but I tried it on my hand. The first thing that I noticed is the smell. It's a very unique smell, not a bad smell though. When I used it on my hand I quite liked the formula. It seemed to give a fair coverage and seemed like a foundation that could be buildable. I'll see how it goes! This foundation is in the shade Bisque, although on the QVC website it was just called 'Light'. My first impressions of this foundation were that it would be far too dark for my skin, but when I tried it on half of my face it seemed to match quite well. 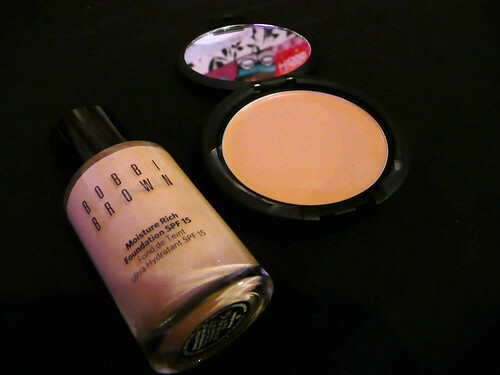 The sponge that's provided seems to work pretty well and I'm thankful that this foundation is full coverage. I'm a sucker for full coverage foundation. In other news, I've been doing some eBay bidding over the past couple of days and when I came across the black suade studded bag from last years Beth Ditto at Evans collection I almost had a heartattack. I SO wanted that bag at the time, but it was £55 so couldn't afford it at the time. The bidding started at 99p so of course I bidded. I was determind to win so put in quite a high bid. I ended up getting the bag for £14. Bargain! I tried it on over my shoulder when the collection came out and its SO comfortable over the shoulder. I can't wait to get it!